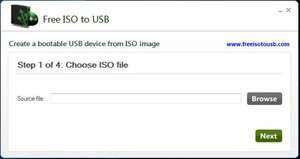 Trying to extract ISO to a USB device is now possible with this free ISO to USB software. Many people are unaware of what the ISO extraction might mean, but the specifics are unimportant with a software program such as this. This Windows application was painstakingly created to avoid many of the problems and difficulties that come with an extraction of an ISO file. Each time an extraction is made from the ISO to a device, there is a progress bar that will indicate the amount of time left in the specific task. For security reasons, you should also check out the Free ISO to USB download at LO4D.com which includes virus and malware tests. Additional screenshots of this application download may be available, too.